Indians Baseball Cards: Tribecards from Colorado Springs: A Fat Pack! Hey everyone! Hope your summer has been humming along well. My family and I enjoyed a rather full day yesterday! We visited the Air Force Academy, Royal Gorge, and ate at the Airplane Restaurant. Yes, they took an old refueling plane and made it into a restaurant! Very cool. 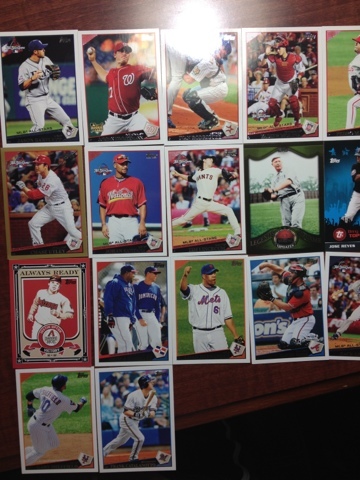 Now, I know you are here for the wax, so how about 2009 Topps Updates and Highlights 36-card pack! Once again, there seem to be a couple players that show up as free agents. I've searched various posts, drafts, etc and come up empty (ex: Carl Crawford, Cy Young). When I get back from vacation, I will do some double-duty checking on my home PC to be sure. If you believe you claimed any of the free agents revealed, and you can show where the error occurred, let me know. Thanks! In the meantime, how many METS can we get in one pack!? Holy smokes... Congrats to all the managers who took in players and to Erin who scored two of them herself! We won't know about Dominicfdny until the end-of-season multi-manager mashup giveaway (haha, or whatever it's going to be called). NO ONE PICKS BECKHAM AS A FREE AGENT! Wow, what heartless, cold-hearted person would go against that request! ?